I love free-riding, heading down an unfamiliar road at speed just for the hell of it. I don’t have to be anywhere at any particular time, I’m just heading where the road looks good and enjoying the ride. I’m not sightseeing, instead challenging myself a little, using my experience to work out where the road twists and turns. After leaving Crescent Motorcycles to meet GSX-R1000 K5 owners (see story on the opposite page) I’ve decided to head to Zig Zag Hill on the B3081, then from Shaftesbury turn east towards Salisbury on the A30. For more on MCN's 2015 fleet click here. 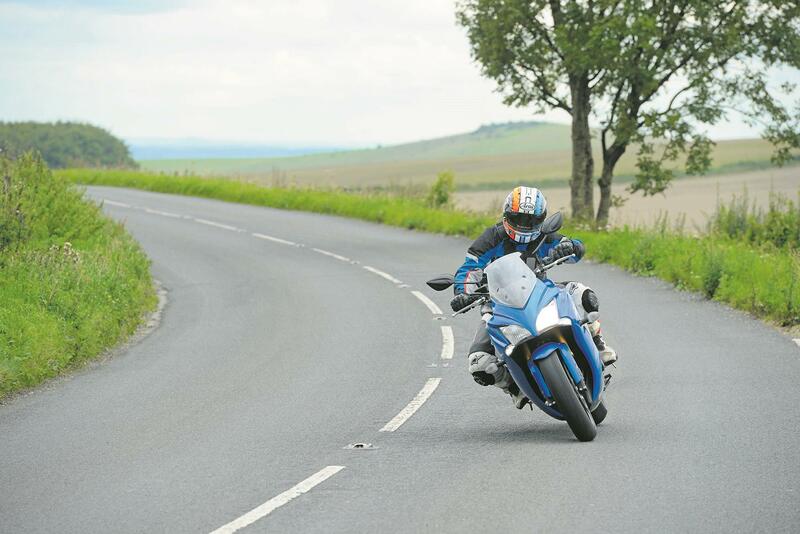 I don’t know the roads but they look fun, and the GSX-S1000F is in its element. The midrange torque is lovely and 40mph-75mph in top gear is effortless as I leave the many picturesque villages and head towards another section of bends. The relaxed ergonomics are near perfect, the upright bars feel natural and the seat is surprisingly comfortable. The steering is light and agile, and I have traction control and ABS as a safety net should I get too carried away. On fast A-roads and switchback B-roads the GSX-S feels right at home. It is in many ways a relaxed sportsbike with lots of grunt. There is so much I like about the new Suzuki. I love the way once you’ve switched off the traction control it stays off. I love the way you can start it without holding the clutch in. The steering is excellent, really sharp, yet it’s stable and the ergonomics are really comfortable. However, Suzuki, don’t add me to your Christmas card list yet – there are some parts that I find hugely annoying and I’m confused as to what the bike is meant to be. The fuelling is shocking for a new bike, particularly at speeds below 40mph making it really noticeable around town. It’s one of the worst throttle responses I’ve experienced on a new bike for some time. I’m sure the problem can be dialled out with some dyno time and work on the fuelling, but this is a 10-grand bike and it shouldn’t have problems like this. The bodywork and screen prove near useless above 80mph, and at 90mph the windblast is almost unbearable. The screen simply isn’t large enough and it’s so bad it’s almost like riding a naked bike. I know Suzuki keep saying it’s not meant to be a sports-tourer, but I was expecting some protection from the screen. Despite saying ‘Brembo’ on the side, the brakes simply aren’t strong enough. From 70mph it takes 52 metres to come to a stop. The heavier Kawasaki Z1000SX takes less than 50 metres, and back in 2005 Suzuki’s GSX-R1000 stopped in a shorter distance too. The GSX-S has no room for a pillion, nowhere to strap luggage to, the suspension is on the hard side and, though I know it’s a personal opinion, it’s not a stunning looker. I’ve asked followers on Twitter, chatted to people at bike events, and I’ve only met two people who actually like the look of it. If you want a sporty Suzuki with road manners then Suzuki already make one: it’s called a GSX-R1000. The GSX-R1000 is only £600 more, has better fuelling, is comfier at speed, way better handling, more fun and even more accommodating for a pillion. It doesn’t have traction control, but it does have rider modes which can limit the power. If I was going to go touring at speed around Europe for a week I’d opt for the sporty GSX-R.